Earlier this year, PennDOT had the unique and privileged opportunity of making a connection that would ultimately help fulfill a special wish. Parker D'Appolonia, 9, tours a locomotive with his CCChampions mentor Brian Wingrove. PennDOT helped set up the meeting for Parker, who hopes to be a train conductor when he grows up. 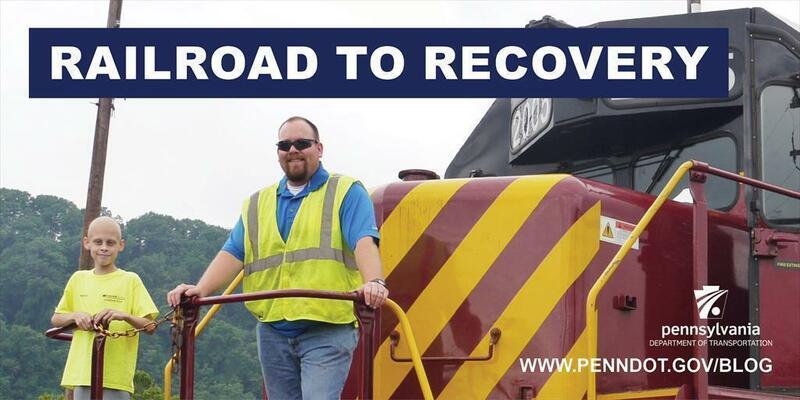 CCChampions, a Pittsburgh-based nonprofit, contacted Dave Conrad, former railroad coordinator for PennDOT's Pittsburgh-area District 11. The group told Conrad about Parker D'Appolonia, a 9-year-old who would like to be a train conductor when he grows up. He wished to meet someone from a railroad. Conrad then contacted Adam Zweig, right-of-way manager at Carload Express Inc., who was excited to make the wish come true. CCChampions' mission is to match kids with cancer to inspirational role models by asking "What do you want to be when you grow up?" "Our organization aims to create a long-term friendship with a local role model that can be there through all the transitions of the cancer journey," said CCChampions Executive Director Sidney Kushner. The organization arranged a meeting in June at UPMC Children's Hospital of Pittsburgh with Parker, Zweig, and Parker's mentor, Brian Wingrove of Carload Express. Also there were Jen Lutz and Coy Thompson of CCChampions, as well as Parker's mother, Samantha D'Appolonia. Parker D'Appolonia, 9, shows off the trains decorating his hospital room to Brian Wingrove, sitting, his CCChampions mentor, and Adam Zweig, both of Carload Express Inc.
Parker had been recently diagnosed with cancer and was receiving treatment at the hospital. "Parker's room was decked out with everything trains and they spent an hour talking trains, trains, trains," Kushner said. "He was so excited that he and his mom even practiced his questions the night before. Afterward, he couldn't stop telling everyone in the hospital about his new friend Conductor Brian." A second meeting was arranged in August at the Allegheny Valley Railyard after Parker received permission from his doctors. This time Parker was accompanied by his dad Nicko D'Appolonia and others from Carload Express, including Chief Executive Officer James Streett. He was given the opportunity to tour a locomotive and learn about the inner workings of the components from the mechanical staff. "Conductor Brian" even allowed him to blow the horn. "It's just such a great sound" were Parker's words, according to Kushner. Wingrove introduced Parker to several of the folks at the railyard and gave him an old train number sign. He got to ask a bunch of questions and talk with the crew as if they were peers. "He really knew his stuff!" Kushner said. Wingrove told Parker if they ever needed to test the horn, they'd know who to call. As of the time of this article, Parker is doing well, back at school, and glad to be done with his stays at the hospital.